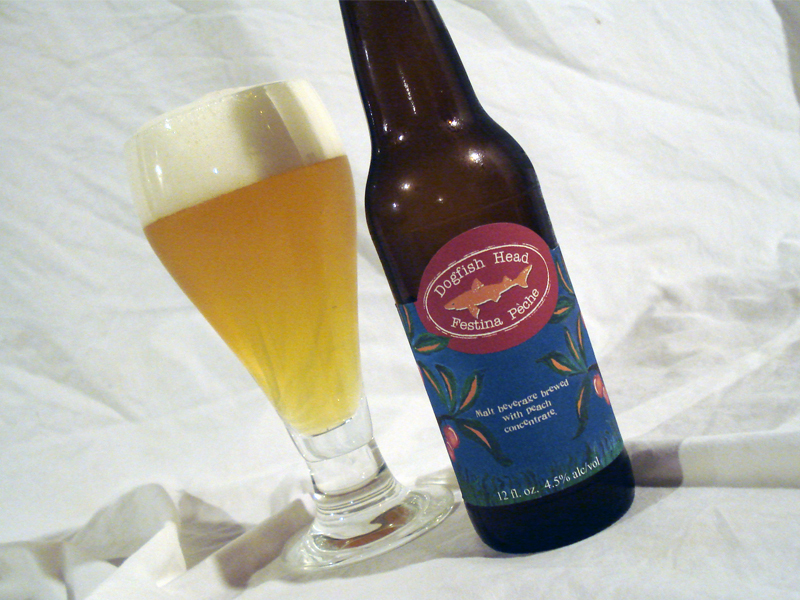 My third Berliner Weisse in the last few months comes in the form of Dogfish Head’s Festina Peche. While I was excited to sample another variation of this style, I was not sure how the addition of peach concentrate would complement the already enjoyable qualities of the Berliner Weisse style. Pouring vigorously into my glass I noticed the color was somewhere between that of The Bruery’s Hottenroth and Dr. Briem’s 1809 – a light straw hue that was just a shape opaque. The head was fizzy, rocky, and died just as quickly as the above mentioned beers (not to mention lambics are similar in this behavior). The carbonation was moderate as a constant bead of bubbles rose from the bottom of the glass. The smell is certifiably peach! It was almost as if I was walking through a peach grove or had freshly sliced up a peach to eat. There was a light wheat malt aroma which enveloped the nose giving body to the tart peach aroma. What I found a little disheartening was that the tart/sour quality seemed to come more from the fruit addition than the vibrant yeast strain used. In other Berliner Weisse beers, the yeast gave a sharp tart aroma while then pulling together the wheat malt in the taste. When it came to the taste I thought it was more of a fruit lambic than anything – albeit the styles seem to be rather close. The mouthfeel was bubbly and the peach did lend a pleasantly refreshing appeal. The tartness is more noticeable on the finish but for the most part the peaches borderline overwhelming. I was hoping for a more complex yeast flavor which did not seem to present itself. While the point of this beer might have been to highlight the peach, I found they did most of the work unfortunately covering up a majority of the other aromas and flavors of the beer. I appreciated Dogfish Head’s experimental approach to this style however, I would have enjoyed sampling a stripped down version sans peach. try a 60/40 blend of 90 minute and festina. makes a great brew.